Rubber rings add a seaside flavour to the bar (even though the idea comes from the landlocked Paris sister hotel). When it opened in Paris in 2008, boutique hotel Mama Shelter felt like a breath of fresh air. Offering hip design on a budget, the hotel was an instant hit, and that's little wonder when you consider the names behind to the project: celebrated Parisian architect and one-time French presidential candidate Roland Castro was put in charge of transforming the building, previously a multi-storey car park in the edgy 20th arrondissement into a 172-room hotel, while France's best-loved contemporary designer, Philippe Starck, designed the interiors. The owners are heavyweights, too: a high-profile consortium that includes the Trigano family, which founded Club Med, and Starck himself. The Paris Mama Shelter was never meant to be a one-off and, four years on, the group - which has promised to open 'Mamas' in cities across the world - has unveiled its second outpost, Mama Shelter Marseille, in the south of France, with further outposts due to open later this year in Istanbul, Bordeaux, Lyon and Los Angeles. Writing about the Paris hotel in The Observer in 2008, design critic Stephen Bayley quoted his then 21-year-old daughter's reaction to the interior design: 'Wow. Cool. It could be anywhere!' Faint praise indeed, but Starck and his team have given Mama Marseille Shelter more of a local identity than its Paris sibling has. Typically for a budget boutique hotel, Mama Shelter Marseille's 127 guest rooms are on the small side, ranging in size from 15 sq m to 45 sq m, the point being that the mostly young guests will spend much of their time in the city or in the public areas, which are designed to be sociable in. An open-plan restaurant and bar space has plenty of references to the hotel's Mediterranean location, including glass cabinets topped with metal octopuses, from Viriato, while fish prints on curtains, on chair backs in the guest rooms, and on the linoleum floor in reception, remind visitors of Marseille's signature dish, bouillabaisse. Rubber rings garlanding a strip light above the bar - a detail from Paris Mama Shelter - feel more at home here in Marseille, where the blue ocean is never far away. Postcards and photographs arranged jauntily around the restaurant's mirrors help create a carefree holiday vibe, while a display cabinet full of musical instruments behind the stage hints at a vibrant nightlife. This laid-back approach is underpinned by cutting-edge technology, including an iMac screen 'photo-booth' where guests can take their own holiday snaps, as well as iMac TVs in all the rooms. Starck could easily have furnished the entire hotel with his own-designed furniture; instead he has been eclectic in his choice of this, lighting and materials, selecting statement pieces such as Stuhlhockerbank by Yvonne Fehling and Jennie Peiz - a surreal amalgamation of a bench and three chairs, which sits at the reception desk. The public areas are decked out in a glorious mix of styles. 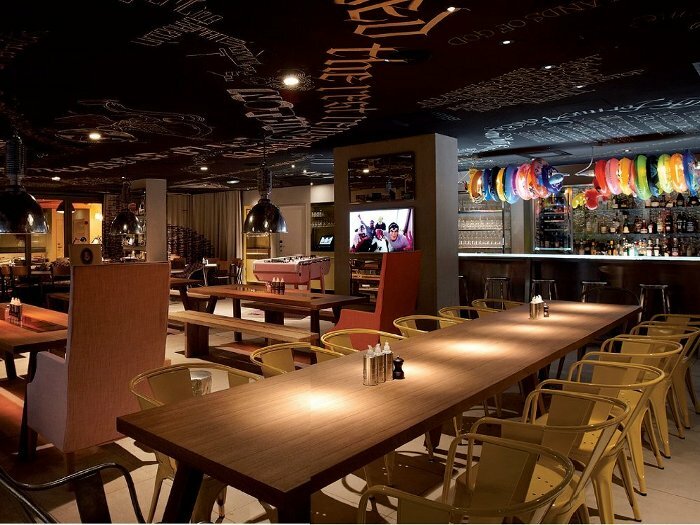 In the open-plan bar and restaurant, for example, industrial-looking metal pendant lights by Zumtobel hang above wooden picnic tables and benches, and long communal tables made of beech are paired with metal chairs by Fermob. Patterns and prints are also eclectic, with traditional houndstooth check patterns contrasting with cushions upholstered in bold, brash cartoon-style prints by Interior Mall. Starck has created contrasts with scale too, with an oversized 'Mama' football table in pink and, in a conference room, a Giant Floor Lamp by Anglepoise. 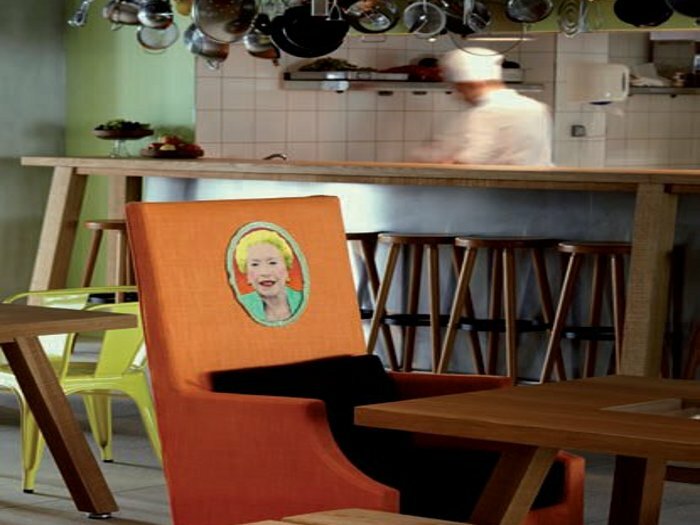 In the wrong hands - and aimed at the wrong clientele - this eclectic design approach could seem either carelessly thrown together or contrived, but Starck pulls it off, making the place feel fun and playful rather than over-designed. 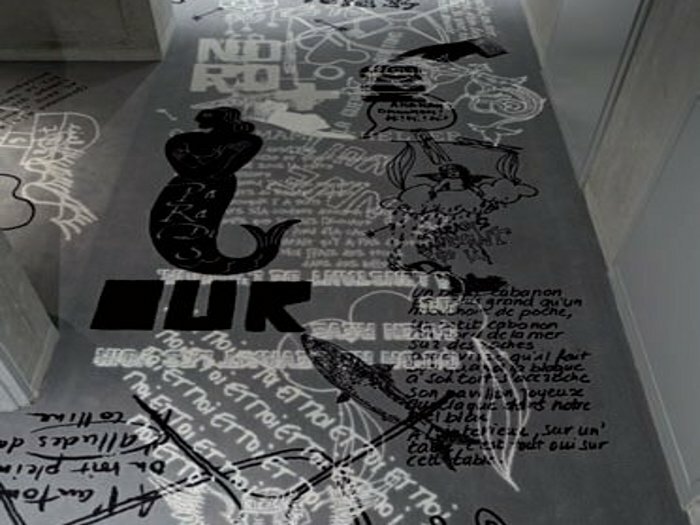 Some details have been carried over from the original in Mama Shelter Paris, such as the exposed raw and waxed concrete walls and graffitied blackboard ceilings by graphic designer Tarek, but there's plenty of new elements, too and, as befits a hotel in sunny Marseille, the interior as a whole feels much brighter and perhaps also more welcoming. In the guest rooms the design becomes much simpler and more classic. The carpets stop at the threshold of the rooms, giving way to a patchwork of grey, patterned linoleum floor tiles. Each room has two white plaster walls and two exposed cement walls - features that the New York Times called 'cold and bland', but which feel right at home with the raw industrial details of both existing Mama hotels; beds have a light-box headboard and there are two full-length mirrors framed in matt silver. Loud, brash, kitsch, eccentric and eclectic, Mama Shelter Marseille may not appeal to everyone - but then Philippe Stark didn't get where he is today by designing bland products and interiors. 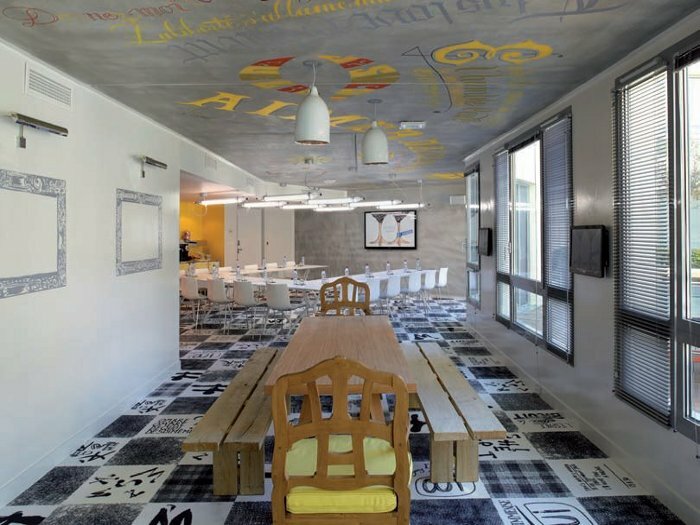 And as the city of Marseille celebrates being named European Capital of Culture 2013, Mama Shelter feels like the right hotel in the right place at the right time.